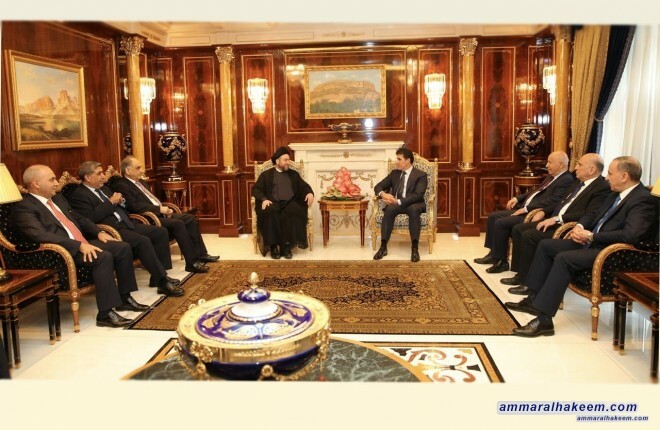 His eminence stressed the importance of dialogue as a method to resolve the problems, plus the importance of supporting the future government and that all assume their responsibilities in achieving the aspirations of the Iraqi people, providing services and employment opportunities. His eminence stressed the importance of focusing on commonalities to serve the sons of the one homeland and reiterated his call to exclude Iraq from regional and international tension and the policy of axes, plus the need to adopt a clear government program based on priorities and a specific timeframe for the provision of services. Head of the Kurdistan Regional Government, Mr. Nechirvan Barzani, showed his support for the future government, and expressed his willingness to cooperate for its success.